Based in Cape Town, SlackGear is a Proudly South African Slackline Company built on ethics of quality, affordability, safety, education, community and customer care. We design, test and manufacture everything needed for any type of slackline, from short park lines to tricklines, longlines and highlines. Our concept is to manufacture everything locally in South Africa. We only use imported parts if they are not currently manufactured in SA or where the quality is not up to standards. All our gear is rigorously tested before being added to the product line. Our concept extends into versatility by using quality components in the shorter kits that can be upgraded later and used in longer or higher lines, so that progression happens without the need to buy all new gear, also making it more affordable to upgrade. We put a lot of emphasis on safe rigging and education through experience. We would like to keep this amazing sport safe so will go out of our way to help those interested in learning and gaining experience in rigging of longlines and highlines. Highlining is actually one of the safest “extreme sports” but it will only stay this way if the correct knowledge of gear and how to use it properly is passed on as the sport grows. 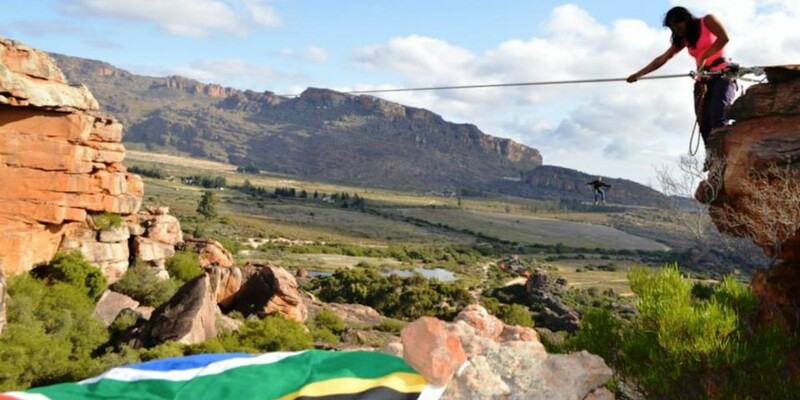 In an effort to keep slacklining legal in parks in SA, and prevent problems as are currently being experienced overseas, we would like to grow an open consciousness and respect towards the effects it may have on public places and the slackline community. This encompasses the damage to trees if tree protectors are not used, public disturbance of having lines crossing paths or in the middle of busy fields and the dangers of running or cycling into them, making them visible with wind dampeners or bright colour tapes etc… If we start early we can prevent issues and by keeping a few ethical choices in mind, everyone can get along and slacklining can thrive in a positive environment.